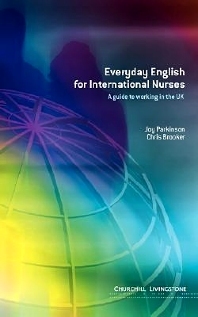 This book helps nurses coming to work in the UK for the first time communicate with patients and staff. It will assist non-EU nurses as they prepare for the English test and adaptation course necessary to practice. Covering a range of subjects, its main purpose is to explain colloquial language that patients might use but is not found in conventional dictionaries e.g. ‘to spend a penny' or ‘trouble with the waterworks'. In addition to communication skills, it contains practical advice on becoming registered, nursing in the UK, and the organization of the health & social care team. · An extensive list of colloquialisms, phrasal verbs & idioms will enable the nurse to understand most of the informal language encountered in practice. · Practical information on getting on the UK register, the IELTS test & adaptation programs will help nurses to get jobs more quickly upon arrival. · Information about the organization of the NHS will help nurses to make sense of the health system and settle in more quickly. · Practical information on resources will help nurses tackle any organizational problems that they encounter. Nursing in the UK. 2. Registering as a nurse in UK and career development. 3. The National Health Service and Social Services. 4. Nursing documentation, record keeping and written communication. 5. Communication in nursing. 6. Colloquial English - Parts of the body - Body functions - Mental and physical states - General expressions - Reproductive and sexual health problems - Glossary of medical and colloquial names. 7. Idioms: parts of the body. 8. Phrasal verbs. 9. Abbreviations used in nursing. 10. Useful addresses, web sites and other resources. 11. Units of measurement. Appendix: General further reading suggestions.